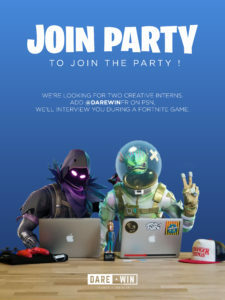 Dare.Win just created the first job interview on Fortnite! At Dare.Win, we are currently looking for a creative team for a six months internship in Paris, starting as soon as possible. With us, they will be creating experiences for brands such as Spotify, PlayStation, Bacardi, YouTube or even their favourite artists and TV shows. You got it, we love entertainment, that’s why this year, we’ll pass the interview on the worldwide battle royale game: Fortnite! If you’re interested, add @DarewinFr on PSN and we’ll schedule a game together.